Using a fork, stir together crumbled graham crackers and melted butter in a small bowl until well combined. 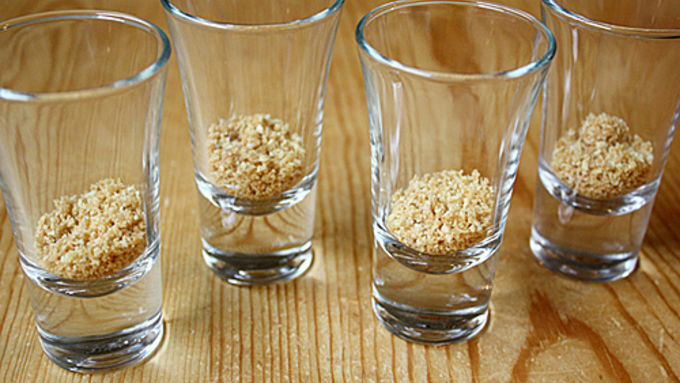 Cover the bottom of your shot glasses with a spoonful of the graham cracker mix. Set aside. In a medium bowl, thoroughly combine canned pumpkin, pumpkin pie spice and sugar until well blended. 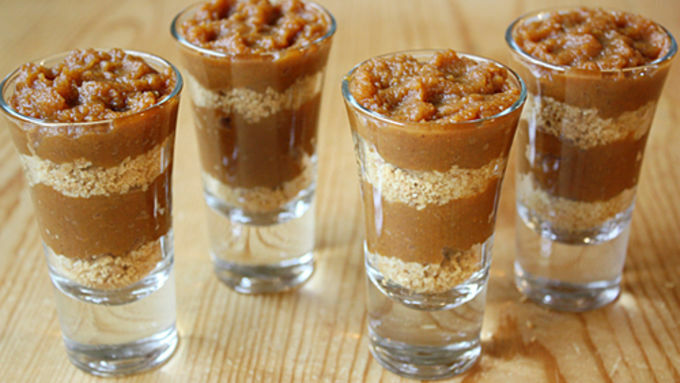 Add a heaping spoonful to each shot glass on top of the graham cracker mix. 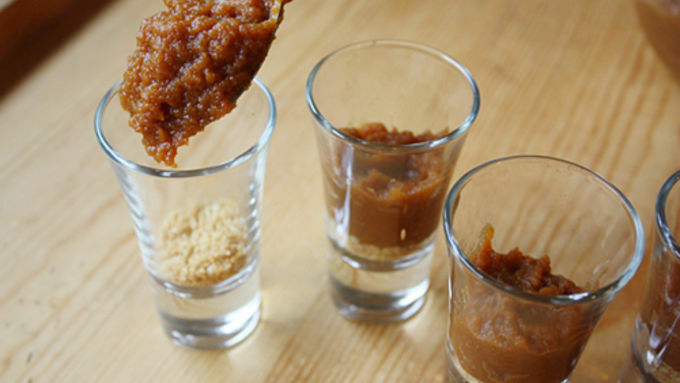 Top pumpkin mix with another spoonful of graham cracker mix, then top that with another heaping spoonful of pumpkin mix so the shot glass is completely full. Place shot glasses in refrigerator while you make your whipped cream. Pour heavy cream, vanilla, bourbon and sugar into a medium bowl. Using a hand mixer on low speed, whisk heavy cream mixture until soft peaks form and the mixture looks like whipped cream. Remove shot glasses from the refrigerator and top with a dollop of whipped cream and a sprinkling of leftover graham cracker mix. Place in refrigerator for 10 more minutes to chill, then serve. There are two things I love most about Thanksgiving: Family and food. I want to be able to enjoy both fully, so finding quick and easy recipes that keep me out of the kitchen as much as possible, but still taste great, are top priority. The same goes for any holiday party: I want to spend more time with my guests and less time with my oven. 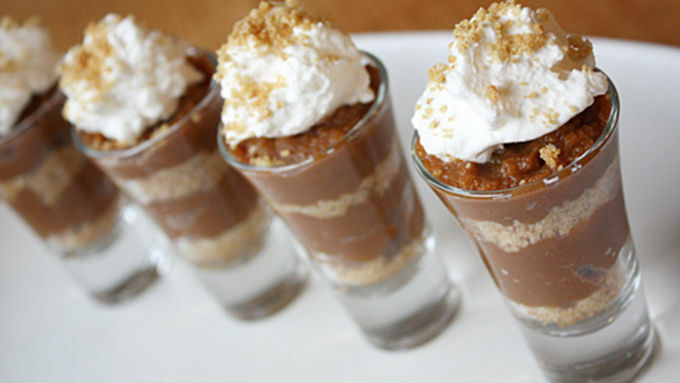 That’s where these Pumpkin Pie Shooters with Bourbon-Vanilla Whipped Cream come in. It’s like a fun-size pumpkin pie topped with a sweet, spiked homemade whipped cream. They taste just like pumpkin pie, but they’re made in a quarter of the time and with half the effort. The only thing quicker will be the time it takes for you and your guests to devour these delicious mini treats. The process of making these is simple: All you do is prepare many of the same ingredients you would for a traditional pumpkin pie, but in far less quantity (which also saves you some dough, literally and figuratively – cha-ching!). Then, you stack them up in a shot glass, let them chill in the fridge for a few minutes, and top with your boozy whipped cream and a little sprinkling of buttery graham cracker crust. It’s that easy! Not only does this recipe save you a ton of time, the bite-size quantity keeps your waistline intact this holiday season (or gives you more room to try other desserts). And if you just can’t keep yourself out of the kitchen, this recipe will give you more time to make your other favorite holiday dishes. 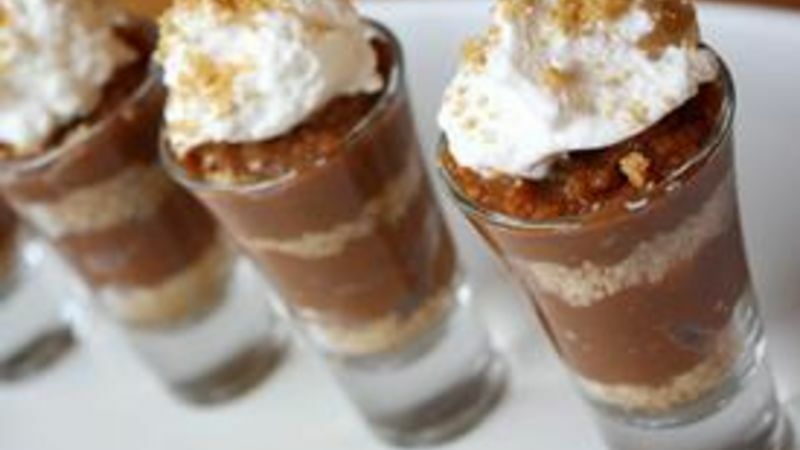 So get those shot glasses ready – it’s time for dessert! When it comes to fall you can never have too much pumpkin. Here are our favorite fall pumpkin recipes.